For the flat panel TVs, see Fujitsu Siemens Computers. For the historical city in Asia Minor, see Myrika. 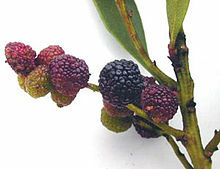 Myrica /mɪˈraɪkə/ is a genus of about 35–50 species of small trees and shrubs in the family Myricaceae, order Fagales. The genus has a wide distribution, including Africa, Asia, Europe, North America and South America, and missing only from Australia. Some botanists split the genus into two genera on the basis of the catkin and fruit structure, restricting Myrica to a few species, and treating the others in Morella. Common names include bayberry, bay-rum tree, candleberry, sweet gale, and wax-myrtle. The generic name was derived from the Greek word μυρικη (myrike), meaning "fragrance". The species vary from 1 m shrubs up to 20 m trees; some are deciduous, but the majority of species are evergreen. The roots have nitrogen-fixing bacteria which enable the plants to grow on soils that are very poor in nitrogen content. The leaves are spirally arranged, simple, 2–12 cm long, oblanceolate with a tapered base and broader tip, and a crinkled or finely toothed margin. The flowers are catkins, with male and female catkins usually on separate plants (dioecious). The fruit is a small drupe, usually with a wax coating. The type species, Myrica gale, is holarctic in distribution, growing in acidic peat bogs throughout the colder parts of the Northern Hemisphere; it is a deciduous shrub growing to 1 m tall. The remaining species all have relatively small ranges, and are mostly warm-temperate. Myrica faya (Morella faya), native to the volcanic islands of Madeira and the Canary Islands, has become an invasive species on the Hawaiian volcanoes where it was introduced in the 19th century; its ability to fix nitrogen makes it very well adapted to growing on low-nitrogen volcanic soils. The wax coating on the fruit is indigestible for most birds, but a few species have adapted to be able to eat it, notably the yellow-rumped warbler and tree swallow in North America. As the wax is very energy-rich, this enables the yellow-rumped warbler to winter further north in cooler climates than any other American warbler if bayberries are present. The seeds are then dispersed in the birds' droppings. Myrica species are used as food plants by the larvae of some Lepidoptera species including brown-tail, emperor moth, and winter moth as well as the bucculatricid leaf-miners Bucculatrix cidarella, B. myricae (feeds exclusively on M. gale) and B. paroptila and the Coleophora case-bearers C. comptoniella, C. pruniella, and C. viminetella. The wax coating on the fruit of several species, known as bayberry wax, has been used traditionally to make candles. It was used for that purpose by the unnamed family in the novel The Swiss Family Robinson. The foliage of Myrica gale is a traditional insect repellent, used by campers to keep biting insects out of tents. Several species are also grown as ornamental plants in gardens. The fruit of Myrica rubra is an economically important crop in China, sold fresh, dried, canned, for juice, and for alcoholic beverages. Myrica is used to spice beer and snaps in Denmark. ^ "Genus: Myrica L." Germplasm Resources Information Network. United States Department of Agriculture. 2006-12-14. Retrieved 2010-10-31. ^ Gledhill, D. (2008). The Names of Plants (4 ed.). Cambridge University Press. p. 267. ISBN 978-0-521-86645-3. ^ Μυρικη was also the Greek name for Tamarix species. ^ Warren L. Wagner, Derral R. Herbst, and Sy H. Sohmer. Manual of the Flowering Plants of Hawaii, Revised Edition, 1999. Bishop Museum Press: Hololulu. ^ "Myrica". Integrated Taxonomic Information System. Retrieved 2010-10-31. ^ "GRIN Species Records of Myrica". Germplasm Resources Information Network. United States Department of Agriculture. Retrieved 2010-10-31. ^ Balakata. Malesian Euphorbiaceae Descriptions. National Herbarium Nederland. Wikimedia Commons has media related to Myrica. This page was last edited on 17 March 2019, at 08:50 (UTC).